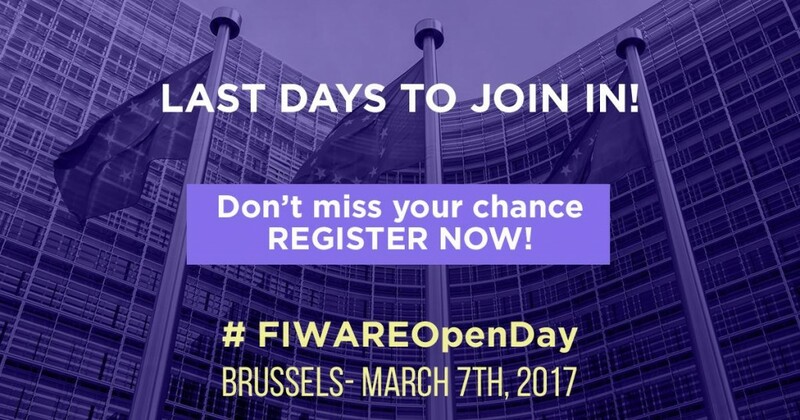 The FIWARE Open Day is just around the corner. Next week, we will be meeting in Brussels, in an event focusing not only in reviewing five years of achievements, but also in analyzing the present stage in the development of the platform and community, originated by the FI-PPP. The Open Day will go on about stating the goals, facing the challenges and seizing the opportunities for the near and far future. The work done by the Future Internet Public-Private Partnership Programme was set up and has unfolded in line with the objectives of the European Commission, towards the creation of a Digital Single Market. In the EC Communication 'Digitising European Industry', FIWARE appears as the main example of the Open Service Platforms that will be leading the global advancement of the Internet of Things and the data-driven society. Also, FIWARE is pointed out as the best example of a “network of Start-up Accelerators”. The FIWARE Acceleration Programme, now relaunched through IMPACT Growth and frontierCities2 open calls –announced this week– and the FIWARE iHub Programme will remain as living, significant assets for the DSI strategy. The creation of a Pan-European network of Digital Innovation Hubs is regarded as an important part of the process. 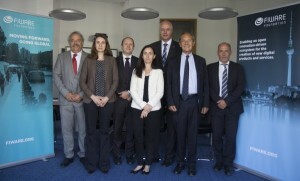 FIWARE iHub model, recently illustrated by the FIWARE Zone initiative, is referred in the aforementioned document: "EU actions supporting competence centres such as I4MS, SAE, FIWARE have shown not only an increase of competitiveness of existing industries, notably for SME and mid-caps, but also additional business creation in new digitised products and services." One of the top level speakers at the FIWARE Open Day in Brussels will be Khalil Rouhana, Deputy Director-General, DG CONNECT, European Commission. Rouhana will be talking about Open Service Platforms as key enablers for the European Industry. In words of Khalil Rouhana, "The FIWARE Foundation is a visible commitment of European businesses to bring more innovative internet services to consumers, citizens, businesses and the public sector. Therefore, the European Commission welcomes the FIWARE Foundation as an important contributor in making the European Digital Single Market a reality, digitising our society and economy, and helping innovation and entrepreneurship to thrive in the EU." In a previous session, chaired by Rouhana, with the participation of Ingrid Willems, from CReatiFI FIWARE accelerator, the link between the Digitising European Industry initiative and the network of Digital Innovation Hubs was discussed. He explained why the word “hub” was chosen, a it represents a more dynamic point compared to clusters or ecosystems. “To achieve outstanding levels of digital innovation in Europe and beyond, it is essential to build digital innovation groups that are more dynamic, having the ability to build and sustain many-to-many relationships between the stakeholders involved” The many-to-many relationship give them the sense of a hub and embodies the vibrant, active nature of the FIWARE community and its members. 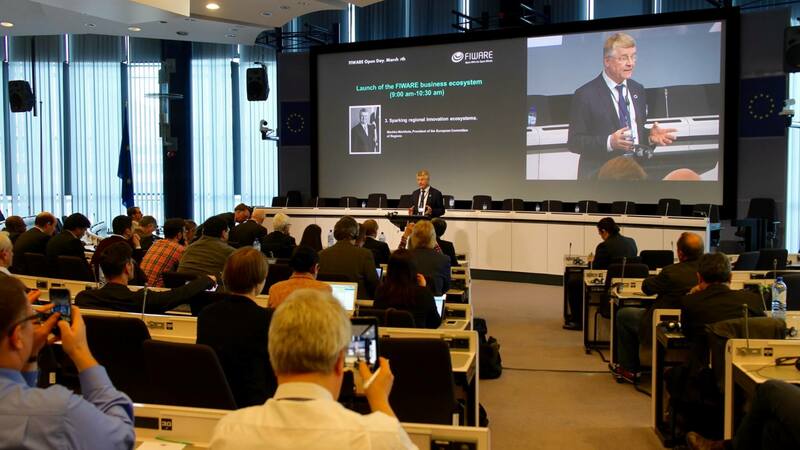 Markku Markkula, President of the European Committee of Regions, emphasized the value of FIWARE for the smart communities and, specially, within the urban domain: "Smart cities and pioneering regions are the cradles for innovation in Europe. By developing an open and sustainable ecosystem, the FIWARE Foundation encourages organisations to become even smarter and take advantage of today's digital opportunities. These developments are crucial for the EU open service platform and the data economy to thrive". Another noted speaker at the FIWARE Open Day will be Yasunori Mochizuki, Senior Vice President of NEC, who will share his global perspective about the role of FIWARE and Industry 4.0 in Japan. The participation of Mr. Yasunori in Brussels illustrates the extended reach of FIWARE, both into new countries and being adopted within more markets and by prominent industrial actors. "NEC, in the past, has contributed to the community of and around FIWARE to implement advanced technical features of IoT and has also brought the technical outcomes into commercial solutions/products for the Smart City business around the world. Meanwhile, the open and transparent approach of FIWARE is becoming increasingly important and also visible in the global scale, which is also the case for Japan after the government has announced the strategy (Science and Technology Master Plan) of “Society 5.0“ aiming at innovating both society and industry via cross-utilization of data through data-centric platform." Khalil Rouhana, Deputy Director-General, DG CONNECT, will share the European Commission vision, where FIWARE and the ‘Open Service Platforms are key enablers for European Industry and the Digital single market’. Markku Markkula, President of the European Committee of Regions, will expose ‘Sparking regional Innovation ecosystems’, like the one the FI-PPP set in motion 5 years ago and which is now expanding globally. Dr. Andreas Goerdeler, Director for “Digital Agenda for Germany und Europe”, Federal Ministry for Economic Affairs and Energy, will present how ‘Open Platforms are supporting Innovation and growth’. Yasunori Mochizuki, Senior Vice President, NEC, will give ‘A global perspective about the role of FIWARE and Industry 4.0 in Japan’, illustrating the extended reach of FIWARE, both into new countries and being adopted within more markets and by Industry key actors. After the introductory session, there will be a Launch Ceremony, significantly titled 'Transition from research & innovation program to a commercial product / platform – from the European Commission to industry'. The event speakers will go over a growing ecosystem and will explore the opportunities offered by the open, standardised APIs for the development of the Digital Single Market and the European Industry 4.0. Companies, institutions and individuals attending this half-day event will be present at the first stages of the go-to-market for FIWARE. ‘The Industrial perspective of FIWARE Open Service Platform’ panel will present the process, originated from the assembly of the Core Industry Group, that led to the creation of the FIWARE Foundation. And will answer an important question: why big ICT and Industry players, like ATOS, Engineering, Orange and Telefónica decided to dedicate big resources to build an Open Service Platform like FIWARE? Ilkka Lakaniemi, Future Internet PPP Programme Chair, will give an 'Introduction to the FIWARE Open Service Platform', preceding a panel including Hubert Tardieu (ATOS and Chairman of the FIWARE Foundation Board of Directors), Paolo Pandozy (Engineering), François Richard (Orange) and Rosalía Simón (Telefónica). Pearse O' Donohue, Director Future Networks, DG CONNECT, European Commission, will propose the 'Next wave / future vision' about the development of this Future Internet initiative. Ulrich Ahle, CEO of the FIWARE Foundation will offer the closing words, reinforcing the focus around the Foundation being the driving force for this new stage, ensuring the long-term availability of FIWARE: for all users, for free and forever. As usual in other occasions gathering our community, networking will play an essential role: coffee breaks and a complimentary lunch at the end of the event will be the perfect moment to share ideas, to strengthen already existing links and collaborations, and to set up new ones. 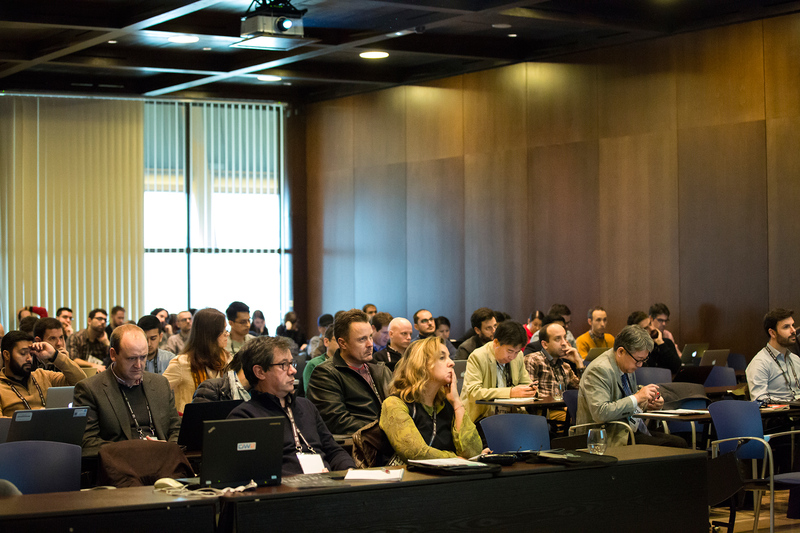 The event is organised by the EC FIWARE team in partnership with the FIWARE Foundation. The Open Day will be held in Brussels on the 7th of March 2017 at the European Commission Charlemagne building, starting at 8 am, for completing the registration process, acceding the building and mingle with other participants, enjoying a drink while waiting for the action to begin! Remember, secure your seat today! See you all in Brussels next week.